Cihuapilli Rose Amador LeBeau interviews Dennis Banks (Ojibwe) and Louise J. Miranda Ramirez (Ohlone) on Native Voice TV. 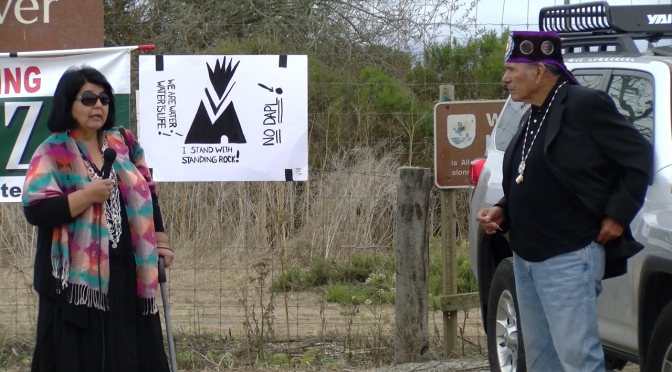 The interview began with Ramirez stating that their are 700 tribal members of the Ohlone Costanoan Esselen Nation of Monterey county who are not ‘Federally‘ recognized although they have petitioned to the federal government. This show has to do with oil corporations utilizing the term “PROGRESS” while destroying the Future of Water for the next 7 Generations. There are small clips of Banks‘ speaking about the resemblance of North Dakota Pipeline and the Monterey county initiative “Measure Z” (Hydraulic Fracturing).